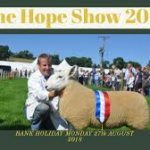 We’ll be attending Froggatt Show on Saturday 25th August. There’ll be: Flowers, Fruit, Vegetables, Hathersage Brass Band, Refreshments and Fun for all the family! Do come and say hello!